The officially licensed Ohio State Buckeyes Riddell Full Size Authentic Helmet will add some collegiate flair to any fan cave with its "just like the college players wear" appearance! 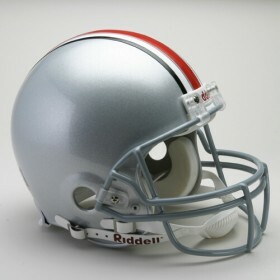 This Ohio State Buckeyes Pro-line Helmet is made with a polycarbonate shell, steel polyvinyl coated quarterback/running back style facemask, 4-point chin strap and team graphics boldly adorning the sides. Meant for display purposes only.